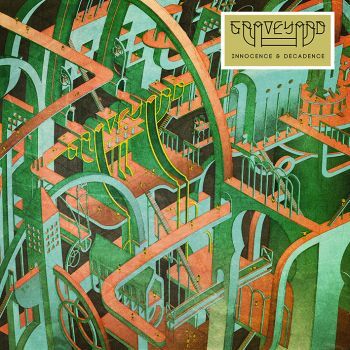 GRAVEYARD - INNOCENCE & DECADENCE (CD) | Online Shop | Wizard LTD. Album: "INNOCENCE & DECADENCE (CD)"
It's classic rock with a modern roll! GRAVEYARD are what one would call everybody's darlings. And there's a good reason for it. With every album the swedish classic rock outfit delivers music that touches, has real depth to it, disturbs at times, catches you and does a lot more to your senses. On stage the band has this unique magic to them with maximum intensity as well as a feeling of being at the epicentre of calm. When talking to them, it is always relaxed and somewhat tongue-in-cheek. It's been a while since the release of the last album though, the larger-than-life »Lights Out«, so there is without a doubt high expectations from both fans and press worldwide, to say the least. So, what are GRAVEYARD bringing to the table this time? At the time of that crucial first spin of »Innocence & Decadence« there will be no doubt that the listener will know, feel and get that this is indeed another album from the GRAVEYARD we’ve learned to love. The new album continues to show how GRAVEYARD, like no other band, can honor rock history in their own peculiar way and at the same time feel more current and hot than global warming. When listening to the album you can find traces of everything from old 20's blues to kraut with synthesizers, Irma Thomas, blast beats and psych rock. Recorded at the infamous Atlantis Studio in Stockholm, Sweden with producer Johan Lindström (TONBRUKET) and engineer Janne Hansson (ABBA, THE HIVES, OPETH) while performing live all together in one room, »Innocence & Decadence« marks the return of original guitarist/singer Truls Mörck who took over the bass from founding member Rikard Edlund who quit the band in 2014. Mörck can also be heard on vocals on the song 'From A Hole In The Wall', whereas guitarist Jonatan LaRocca-Ramm makes his debut on lead vocals on the bittersweet ballad 'Far Too Close'. The band will tour Europe in October / November 2015 in support of »Innocence & Decadence«.